Mardi Gras bead twisting is the art of twisting Mardi Gras beads necklace into shapes and designs. Mardi Gras bead twisting developed from balloon twisters that worked the Showboat Casino in East Chicago Indiana. The Casino would have entertainers pass out Mardi Gras beads to guests for playing select promotional games or while guests were waiting to board the Casino. The Casino entertainers would pass out hundreds of Mardi Gras beads daily. When the gambling boats first started in the Midwest they were required to have actual boarding times, even thought they were anchored you could only board or disembark every hour and a half. This meant the entertainers would have 45 minute shifts, which allowed them to play with the Mardi Gras beads. The entertainers had years of balloon twisting experience they quickly recognized the Mardi Gras beads are just a string of balloon bubbles. They then started twisting the Mardi Gras beads into balloon animal shapes. This was the start of Mardi Gras bead twisting in the Midwest. I learned the basic art from these twisters and have developed new designs which I have written in the book -- Twisting Mardi Gras Beads. This book gives step-by-step instructions on how to twist Mardi Gras bead necklace into works of art. This book is great for kids and adult who want to personalize their Mardi Gras jewelry with a twist. 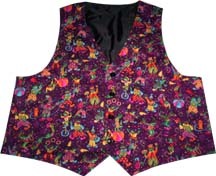 The colorful 4 button with adjustable tie strap, Mardi Gras Vest is excellent addition to any entertainers wardrobe. Comes in two size large and extra large. Limited quantity available. What to make your Mardi Gras event out standing? Then you need to have the best Mardi Gras balloon entertainer in the country! Mardi Gras Parties are the biggest, coolest, and one of the funniest event you can attend. Why not hire the best balloon twister, who will make some of the coolest, oh my gosh balloons you can imagine. Your guests will be amazed, mystified, entertained, and will not be able to stop talking about their evening with Chicago's Best Mardi Gras balloonist! Call today to book him for you Mardi Gras Party. Learn how to make money and twist Mardi Gras Beads from a professional twister. 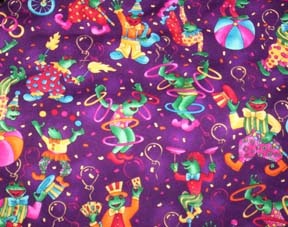 It has 12 designs plus information about Mardi Gras and bead sizes. It's a full color book, 20 pages, 5.5 x 8 inches in size, with detailed instructions on how to take a simple Mardi Gras necklace and turn it into a work of art. This book teaches how to take simple Mardi Gras bead necklaces and twist these necklaces into works of art.